The B section to this song was written first while I was snowed in during a March nor'easter. The song was intended to be a collage of winter images. Later the A section was added but the finished song, although good musically, didn't seem to conform to the winter theme. While in the car a few weeks later I heard a story on NPR about a tragic climb to the summit of Mt. Everest where the participants were caught in a deadly blizzard. Although not about that specific event , Ascension refers to the visual images of climbing. The A section is keyboard dominated, very majestic and is intended to symbolize images viewed from higher elevations. The B section involves more tension and is intended to symbolize the dangers and triumphs of the climb. This piece is along the lines of Frames of Mind musically but a bit more subdued and melodic. The title comes from the daydream quality that much of the song has. There are plenty of time signature changes in this one and some surprises in the middle section. This is one of our favorites. I'm not sure this piece has anything to do with Romeo and Juliet or even Shakespeare but it is intended to be a bit sorrowful. This piece didn't really come to life until Gino gave me some critical feedback about the development section. I then reworked the development which became a lot less stable, far more aggressive, and I hope a lot stronger piece of work. Frames of Mind Pt.1: "Cognitive Synergy"
Frames of Mind Pt. 2: "Dialectic"
This is the title track to our first CD. This 11+ minute piece started as two separate pieces. I wrote the two movements with the idea of writing a couple of 4-6 minute pieces with emphasis on dynamics and rhythmic "grooves", while maintaining a certain progressive edge. There is a lot of variety in this piece but still an undercurrent of continuity that binds it together. Although Gino's title was an afterthought, it nicely verbalizes the different creative snapshots of this piece. This brief solo synth piece was inspired by the first half of Part V of Rush's epic composition Hemispheres - maybe that's why it has "no shape or form". When I introduced this piece to my bandmates, Dave "was astonished"; Joe "thought me mad". This was my first composition for Electrum. The song is a suite with each section having a prominent instrument (Bass, Guitar or Drums) and attempting to musically reflect the moods of different types of verbal communication. The first section has a relatively calm feel and represents the type of conversation we have with loved ones, friends, and new acquaintances. The second section is quite aggressive, as are the heated arguments that humans so love to engage in. The third section is intended to sound uplifting, like the words that the best among us can use to move others to do great things and make great sacrifices. Inspired by Star Trek and the special language of techno babble. According to the Star Trek Technical Manual the inertial dampening system "generates a controlled series of variable-symmetry forcefields that serve to absorb the inertial forces of spaceflight which would otherwise cause fatal injury to the crew". If during the course of an episode the helmsman cries out "Captain, inertial dampers are off-line!" then things get more than a little chaotic. The song is intended to reflect that. It is also worth noting that I, with a bad cold, was on a lot of Sudafed at the time I wrote this piece. This 11 minute piece has been really difficult to complete. There have been many variations in arrangement and entire rewrites of themes over 4 months. The piece begins with a keyboard introduction in a theme and variations form with accompaniment that is poly-metric at times (keyboards in 4/4, bass and drums in 6/8). The body of the piece involves two themes, the first dominated by bass, and the second by guitar. A long bridge acts to join the two themes. There are many time signatures in this one including 4/4, 5/4, 6/8, 7/8, 11/4, and 13/8 (you may have guessed by now that I like to play with the time signatures). The mood of this one is pretty somber but not depressing. 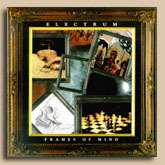 This is the closing track for "Frames of Mind". Gino, master of words, again came up with the title saying the keyboard intro sounded like it was taking us to someplace mysterious.